The Screen element is what determines if your Flow can be autolaunched or not. If you choose to use one of these elements, then you are disabling the ability for this Flow to be autolaunched. I feel that not having a strong understanding everything a Screen can do is one of the biggest hurdles to developing solutions using Visual Flow. Where is the Screen element? You can find the Screen element under the USER INTERFACE section of the Palette. After you drag the Screen onto your Canvas you will notice it has three tabs: General Info, Add a Field, and Field Settings. Lets dive into the General Info real quick! The default for a Screen is that you show the “Previous” and “Finish/Next” buttons on your Screen. However, you can customize this to meet your needs. You have the options to show only one of those buttons. In most situations, the default value is going to meet your needs. 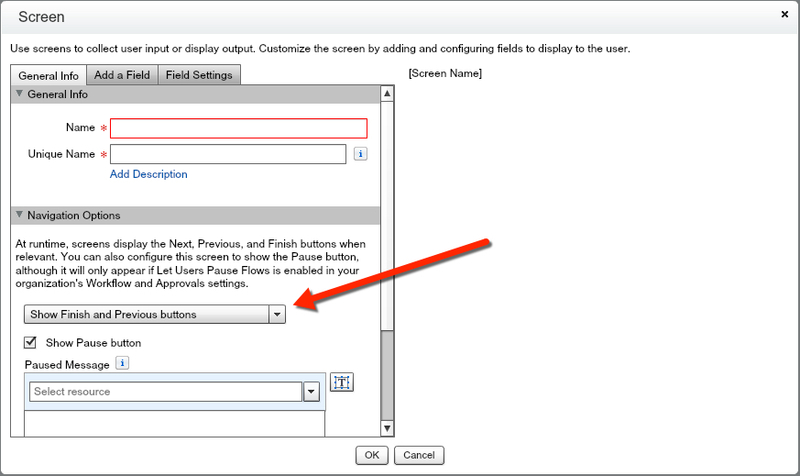 As of Spring ’15 you now have the option to Pause a Flow. This is a separate button that is checked by default. This allows your users to Pause what they are doing. The typical use-case would be a Custom Support Agent having a Client need to call back mid-Flow. You are able to enter a Paused Message using a Display Text output. You can reference different resources from your Flow in this. The next tab in a Screen is the “Add a Field” tab. In here you have a selection of numerous types of fields that you can add. This is the fun part of a Screen! We will dive into each of the different sections in their own blog posts, but for this post we will show adding a simple Textbox. You will notice that many of these fields have the ‘standard’ use cases that you would expect from adding Custom Fields onto an object, but there are a few hidden gems to discover in the “Field Settings” tab. Do you want to have a label? Do you want to have a Default Value? Do you want to bring in an existing variable? Do you want a validation rule? 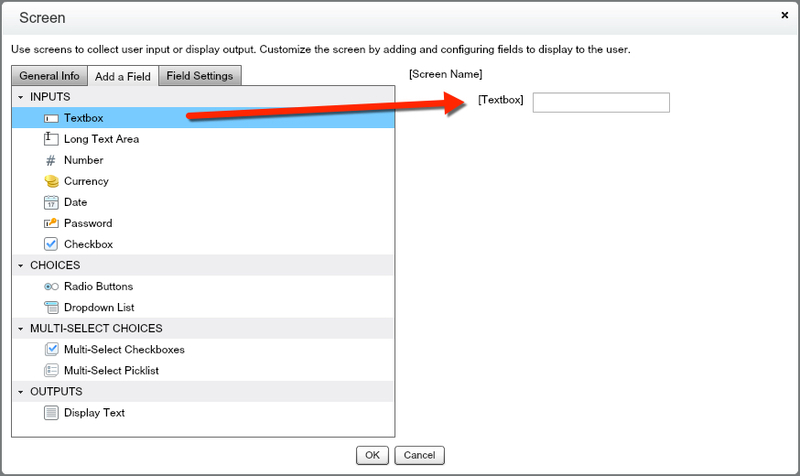 If you have multiple fields on a Screen, the field that you have highlighted in Blue will be the field that is being displayed in the “Field Settings” tab. RECAP: Screen elements are your UI in a Flow. Think of them as a sort of form that the user interacts with. Decide what ‘input’ you need from your users and then go build it!